Kenichi Aoshiba was born on September 1, 1912 in Sonobe-machi, Kyoto, Japan. He attended Otani Chugakkou high school and Ritsumeikan University before playing industrial league baseball with Toyo Bearing and Dairen Jitsugyo. 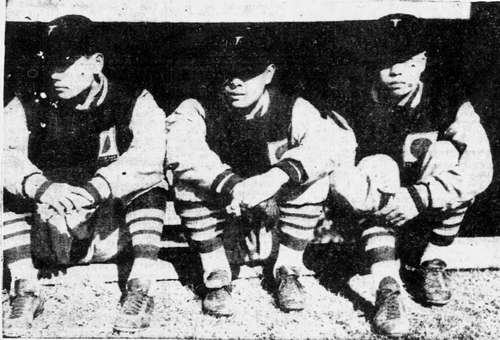 When an American League all-star team toured Japan in 1934, Aoshiba was selected for the All-Nippon team pitching staff. Hurling against Babe Ruth, Earl Averill, Lou Gehrig, Charlie Gehringer and Jimmie Foxx, Aoshiba made six appearances for an 0-3 won-loss record. In 1934, he was signed by the Dai Nippon Tokyo Yakyu Club – Japan’s first professional baseball team and forerunner of the Tokyo Giants. After Aoshiba toured the United States with Dai Nippon in 1935 and the sprig of 1936, the Japanese Professional Baseball League started in 1936 and Aoshiba pitched for the Giants until 1938. In the fall of 1938, the 26-year-old was drafted for military service. He died of disease at the Pyongyang Military Hospital in North Korea on November 1, 1945.